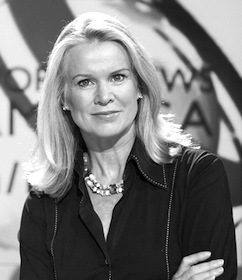 Katty Kay is the lead anchor on BBC World News America. Prior to taking over as lead anchor, Kay served as Washington Correspondent for the BBC. Kay’s career with the BBC began in Zimbabwe in 1990 where she started filing radio reports for BBC World Service radio. While there, she also covered the end of the apartheid in South Africa. Kay then went on to work as a BBC correspondent in London, and later Tokyo, reporting on stories including the Kobe earthquake and the Japanese economic recession. She settled in Washington in 1996 where she took some time out of broadcast journalism to join The Times’ Washington bureau before returning to the BBC in 2002. From Washington, Kay covers a broad range American and global affairs – reporting on U.S. elections, the White House, Congress, Wall Street, global economies and world trouble spots. Kay also witnessed and reported on the drastic change in American policy and psyche brought on by the September 11th attacks. Kay was at the Pentagon just 20 minutes after a hijacked airplane flew into the building – one of her most vivid journalistic memories is of interviewing soldiers still visibly shaking from the attack. Kay is a frequent guest commentator on NBC’s Meet the Press, The Chris Matthews Show, and MSNBC’s Morning Joe, to name a few. In her New York Times best seller, Womenomics: Write Your Own Rules for Success, Kay and co-author, Claire Shipman, explore how women can create a professional life that meets their needs, resulting in more profitable companies with happier employees. Kay grew up all over the Middle East, where her father was posted as a British diplomat. She studied modern languages at Oxford and worked for a brief period at the Bank of England. She speaks fluent French and Italian and also what she describes as ‘rusty Japanese’. Kay is married to Tom Carver, a strategic risk consultant. They live in Washington, DC with their four children.